Yamaha RX-A1020 review | What Hi-Fi? The Yamaha RX-A1020 is the second AV receiver we’ve seen from Yamaha’s new 2013 range – and we have high expectations. For Yamaha is on a roll when it comes to turning out machines to take the all important place as the brains and the brawn of your home cinema system. At the end of last year, the company scooped not one but two What Hi-Fi? Sound and Vision Awards in this category, cornering the market with two excellent models at the affordable entry-level and ‘step-up’ price points. Furthemore, the first of the company’s 2013 receivers, the £3000 Yamaha RX-A3020, walked away with a glowing five-star review. That simply leaves this £1000 category as the one slice of the market Yamaha has left to conquer. Naturally, we can’t help but fancy the RX-1020’s chances. There are four models in the Aventage range, with this the second most affordable on offer. Predictably, it follows down a similar path in terms of build, specification and, ultimately, performance as the top dog in the Aventage range, simply sheering off a few features and a little power along the way. So, this is a 7.2-channel AV receiver, offering two zones of entertainment – pay more to get a machine with more channels and zones. Yamaha claims a rated power of 110 watts per channel in to 8 ohms: again you can get more – 140W, then 150W – on the two models above the 1020 in the range. Elsewhere you won’t find the company’s HQV video processing, nor a handful of more niche features – namely High Resolution Music Enhancer and Component Upconversion. We’re not sure many people will greatly miss these. And that’s about that: there’s a lot else still very much on the spec sheet, such as 4K passthrough and upscaling, not to mention support for 3D passthrough. You get the same number of HDMI inputs and outputs on every model in the range (eight in and two out, with the latter allowing you to run two video outputs at the same time), complete with Audio Return Channel, plus a front-mounted USB input that supports playback from iOS devices and memory drives. Legacy video connections, plus digital and analogue audio inputs and outputs, are also out in force and as thorough as you’ll find anywhere in the range. There's an Ethernet connection for networking although there’s no wireless out of the box. There’s an optional YWA-10 wifi dongle available for £75. There’s a full complement of supported surround-sound codecs, a huge choice of sound modes, networking capability for streaming music from DLNA devices (think NAS drive or a PC), Apple AirPlay, and internet, FM and AM radio. But then this is a £1000 AV receiver... of course it does a heck of a lot. The unit itself looks smart with a two-tone front fascia and a variety of Yamaha construction technologies that ultimately claim to give the receiver the most solid foundations upon which to work its magic. This includes the company's Anti Resonance Technology (A.R.T.) Wedge and Rigid Bottom Frame. The proof of that particular pudding can only come in the eating, though. And, once we've sampled it, we’re happy to report the proof is well and truly here. The YPAO set-up and calibration with the integrated mic is a doddle, taking just a few minutes. It proves very accurate in terms of speaker distance and levels (although we had to adjust our centre from ‘small’ to ‘large’). And then we’re in business. For this sort of money, the power and dynamics are superb. With The Amazing Spider-Man playing in our reference Marantz UD7007 Blu-ray player, it’s an exciting, tense, atmospheric experience – everything we’d expect when enjoying an excellent test disc. There’s impressive detail in quieter scenes, speech is handled nicely (you can boost the dialogue if you want: we didn't feel the need) and there's plenty of authority on tap, with good control and clarity – even when the action ratchets up. Bass hits will jolt you up right in your seat – but fade away just as impressively – while surround effects sweep around the room with speed and agility. The RX-A1020 just seems to find its work so easy – and so enjoyable. The Yamaha’s power and control almost invites you to push it to its limits, thundering through Thor, tiptoeing through the magical animation of Coraline and simply reveling in entertaining when we play some music Blu-rays. Beyonce's I Am... Yours Blu-ray has plenty of energy and it’s brilliantly conveyed, the Yamaha proving adept at holding a tune, and placing sounds and instruments in the soundstage. It’s more of the same when playing a CD, streaming music from our MusicM8 NAS drive or listening via a connected Apple device on the front USB slot. We prefer music in stereo generally, but it’s worth experimenting with the 17 (count ‘em) DSP modes, to see if one takes your fancy. We settled for stereo or Pure Audio. The addition of AirPlay is a nice touch, as is the USB input on the front for iOS devices, though it would be nice to see support for Android devices too. While DLNA will work for some, an MHL HDMI input or Bluetooth would be handy. It’s easy to love this Yamaha AV receiver. 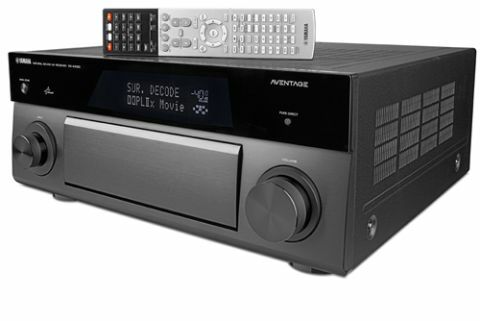 It looks the part and has a whole host of features and functions, but ultimately the RX-A1020 simply gets down to the business of delivering brilliant surround and stereo sound with the minimum of fuss. There’s excitement, power and scale, coupled with the necessary timing, attention to detail and control. We had high expectations: this Yamaha utterly delivers.